Firstly, I was walking down smith st the other day, past the in.cube8r gallery and I saw this dreadfully serious little owl staring out of the window. It’s a medallion from a woven carpet of an old Masonic hall I visited on the weekend. Although they’ve redone the carpet in about the 80s, they treasured the old carpet enough to cut out a piece and frame it (hence the weird reflection on the top left corner from the glass). Imagine a whole room with carpet like this! Since the top has a black checkered pattern on it and the bottom doesn’t, that makes me wonder if this design wasn’t all over the carpet but instead was only the border, and if that was true, I wonder what the rest of the carpet looked like (see? The time spend reading that History of Textiles book was totally worth it!) There were a couple of old photographs of the rooms, but nothing showed the floor. I’m thinking of making a tapestry based on this design. I’d love a recreation of an old craft work. In fact, I’m also making a quilt from sepia and white coloured material from old clothes. 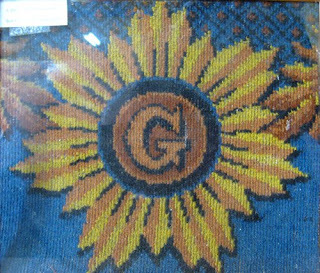 The pattern is based on a quilt in the The Gentle Arts. book. I’m all for using the knowledge and patterns of the past at the moment. 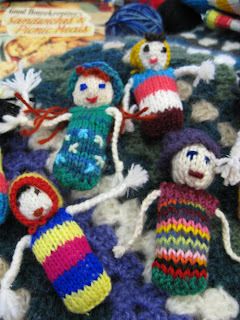 They’re some of the many worry dolls that the ladies have made in the Knitting Workshop. This afternoon is the last class for the semester. We’ll be making our favourite dolls into badges to sell at markets. It should be a fun afternoon. Yah for spending the Kruudy cash by supporting other crafters! 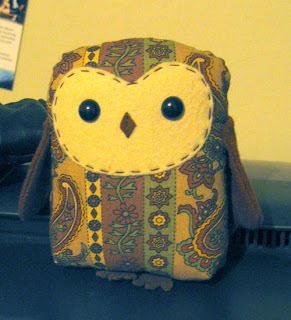 Becclebee: The owl is even cuter in person, the light was terrible in the loungeroom 🙂 And I’m writing the worry dolls patterns up soon too. CurlyPops: I know! How great is it to be given money to buy nice things from nice people? The in.cube8r gave me a fridge magnet with my purchase that says “I fed a Melbourne artist today” Nice warm fuzzy feelings and some rocking stuff to boot. Lovely!